Play golf? Let’s say you’re in a fairway, about 180 yards from the green. You reach in your bag and then pause with uncertainty; do you want the loft and precision of an iron or the straight-ahead power of your fairway wood? It’s a tough decision – until you remember the hybrid club you got for your birthday. Your give it a smooth swing and watch as power and precision combine to place your ball about 5 feet from the pin. Before we get to the hybrid 3PL model, let’s first understand the components it combines. 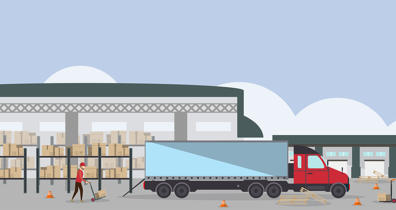 With the asset-based model, a 3PL owns and operates the assets and equipment (e.g., the trucks, trailers, and warehouses) and charges its customers a fee for the use of that equipment. The non-asset-based 3PL, on the other hand, does not have its own equipment. You’re relying on its expertise and its network of logistics providers to orchestrate distribution operations with objectivity. Securing truck capacity. An asset-based carrier has a finite number of trucks, so when they’re all in use there is no capacity to be had. On the plus side, the asset-based 3PL will likely have a firm handle on its own scheduling and will be able to give you an accurate estimate as to when your load can be accommodated. Non-asset-based companies rely on a network of carriers. Your opportunity for capacity spreads as far and wide as the size of this network, with each carrier a potential source of capacity. Building relationships. When you work with asset-based 3PLs, over time its warehouse associates and drivers begin to understand your products, your requirements, and your customers. This can have an upside impact on speed and service quality, such as when drivers build personal relationships at the consignee and understand how they like to receive deliveries. Of course, you can also build effective relationships with non-asset-based providers. The main difference is that, in the non-asset-based model, your actual operations are going to be handled by multiple companies (and multiple sets of warehouse associates and drivers). Any one of these companies is unlikely to handle your operation with the kind of regularity needed to build expertise. Flexibility and customization. Because a non-asset-based 3PL has no assets of its own, it doesn’t need to fit your operational needs into its existing infrastructure. This allows for more flexibility and customization as your needs dictate the equipment used and the operations performed. In the asset-based model, the concern is that the 3PL may want to fill its own assets, even if though its own equipment and availability may not precisely align with the shipper’s need. Reducing costs. There are general cost-saving benefits with each type of 3PL. Asset-based companies can set their own pricing and can build in additional discounts when you utilize multiple services or take advantage of mutually-beneficial scenarios like backhauls. Non-asset-based 3PLs with large networks of partners can save you money through the size of their network – shopping for services on your behalf and securing the lowest rate. In recent years, some asset-based 3PLs have kept pace with logistics industry changes by adding a non-asset-based component to their operations. This allows them to continue to serve customers when their assets are currently in use or additional assets are required. It allows their customers to enjoy expanded capabilities, while still dealing directly with a trusted 3PL partner. For starters, this hybrid model typically involves freight brokerage services for added capacity. Retailers now commonly want less-and-less inventory on hand, but they are not immune to unforeseen demand spikes that necessitate urgent product requests. If the 3PL doesn’t have available capacity of its own to meet a last-minute request, it can still spring into action by leaning on its carrier network. Such a carrier network also enables asset-based 3PLs who primarily operate in a specific geographic region to expand their reach – and that of their customers – into other areas of the country. Asset-based providers can also jump into hybrid mode when it comes to warehousing. Let’s say that a company has an asset-based 3PL partner for warehousing and distribution. The company is happy with its 3PL relationship but needs to expand its distribution network. As with transportation, the 3PL can lean on its network of logistics providers to provide warehousing services in this new location(s) – while maintaining the quality of service it has already established. This consistent quality of service is a unique selling point that hybrid 3PLs bring to the table. When a 3PL has developed a successful partnership with its customers through its asset-based operations, it already knows precisely what they need and how to provide it. The 3PL is then uniquely qualified to vet its network of providers to ensure that this level of service will be maintained. After all, the customer is still dealing directly with the same 3PL and the successes or failures to come will be attributed to that same 3PL – hybrid or no hybrid. Kane Is Able (KANE) has established a national network of over 100 hand-selected carriers that have been thoroughly vetted to ensure safety, reliability, and quality of service. For our freight brokerage operation, KANE utilizes a Carrier Partners Scorecard program to constantly monitor each partner’s performance. When a load is tendered to KANE, we take all responsibility for that load from pickup to delivery. You will never have to chase a third party to get answers. To learn more about the advantages of a hybrid 3PL, contact KANE today.